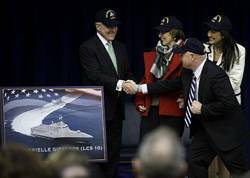 Secretary of the Navy Ray Mabus announced Feb. 10 that the next variant littoral combat ship (LCS) will be named USS Gabrielle Giffords (LCS 10). The selection of Gabrielle Giffords, designated LCS 10, honors the former congresswoman from who is known for supporting the military and veterans, advocating for renewable energy and championing border security. Giffords recently resigned from Congress to recover from wounds she sustained in an assassination attempt in 2011. "The Navy motto is Semper Fortis, Always Courageous," said Mabus during a ceremony held in the Pentagon Courtyard. "Unwavering courage has defined the Navy for 236 years and it is what we expect, what we demand of our Sailors every single day. So it's very appropriate that LCS 10 be named for someone who has become synonymous with courage, who has inspired the nation with remarkable resiliency and showed the possibilities of the human spirit." Mabus also announced the ship's sponsor will be Roxanna Green. Green is the mother of Christina-Taylor Green, the nine-year-old girl who was killed while attending the meeting of constituents where Giffords was shot. A ship's sponsor plays an important role in the life of the ship, naval tradition holds that her spirit and presence guide the ship throughout its service life. "On that dark, tragic day now more than a year ago, Christina-Taylor Green was taken from us. A nine-year-old who had just been elected to the student council, she wanted to become a more active participant in our democracy. Her mother, Roxanna Green, continues to express her daughter's hope for the future and, as the President said, "of a nation as good as she imagined." "I am pleased to honor Gabrielle Giffords and the people of with the naming of this ship," said Mabus. "Giffords and the ship's sponsor, Roxanna Green, are sources of great inspiration and represent the Navy and Marine Corps qualities of overcoming, adapting and coming out victorious despite great challenges." The ship is part of a dual block buy of LCS class ships announced by Mabus in December 2010. By procuring both versions of the LCS - Lockheed Martin's semiplaning monohull and General Dynamic's aluminum trimaran - the Navy is stabilizing the LCS program and the industrial base with an award of 20 ships each; increasing ship procurement rates to support operational requirements; sustaining competition through the program; and enhancing foreign military sales opportunities. Both designs meet the Navy's LCS requirement. However, the diversity provided by two designs provides operational flexibility. Littoral combat ships perform a vital role in the Navy's ability to execute DoD's Defense Strategy. USS Gabrielle Giffords will be designed to defeat growing littoral threats and provide access and dominance in the coastal waters. A fast, agile surface combatant, the LCS provides the required warfighting capabilities and operational flexibility to execute focused missions close to the shore, such as mine warfare, anti-submarine warfare, and surface warfare. The LCS class of ships will be outfitted with reconfigurable payloads, called mission packages, which can be changed out quickly as combat needs demand. These mission packages are supported by special detachments that will deploy manned and unmanned vehicles and sensors in support of mine, undersea and surface warfare missions. This is the 16th ship to be named for a woman and the 13th ship to be named for a living person since 1850. This is the first ship to bear Giffords' name.